Harry S. Truman became the 33rd President of the United States following the death of President Franklin D. Roosevelt on April 12, 1945. He led the country through the final months of World War II and the policies he enacted—many of which touched on immigration—helped shape the postwar order at home and abroad. 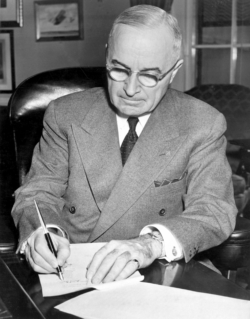 In 1950, Truman established a Presidential Commission on Migratory Labor to examine “the extent of illegal migration of foreign workers into the United States.” The next year, Truman signed legislation to protect farmers’ ability to hire legal migrants as farm laborers, while decrying illegal immigration. The legislation set up centers where immigrants from Mexico could stay while the U.S. government matched them with jobs. Still, Truman worried that illegal immigration was a threat to the jobs of both U.S. citizens and legal immigrants. He called for legislation that would provide punishments for employers who harbored illegal immigrants, but Congress declined to pass it.